113 FACT BOOK 2015 m ETRO m AGAZINE > industry contacts Operation Respond Institute 401 Constitution Ave., NE Washington, DC 20002 Phone: 202/548-0935 www.OREIS.org OREIS@erols.com Jin Boone, pres. Oregon Dept. of Transportation 355 Capitol St., NE, MS 11 Salem, OR 97301-3871 Phone: 888/275-6368 Fax: 503/986-3432 oregon.gov/ODOT askodot@odot.state.or.us Matthew Garrett, dir. Oregon Transit Assoc. 6745 SW Hampton, Suite 101 Portland, OR 97223 Phone: 503/601-5336 Fax: 503/597-3668 www.oregontransit.com info@oregontransit.com Kelly Ross, association mgr. P Pennsylvania Bus Assoc. 4405 N Front St. Harrisburg, PA 17110-1709 Phone: 717/236-9042 Fax: 717/236-1391 www.pabus.org efarrell@pabus.org Elaine Farrell, exec. dir. Pennsylvania Dept. of Transportation Riverfront Ofce Center 1101 South Front St. Harrisburg, PA 17104-2516 Phone: 717/412-5300 www.dot.state.pa.us Bradley L. Mallory, dep. sec. admin. New York State Energy Research and Development Authority 17 Columbia Cir. Albany, NY 12203-6399 Phone: 518/862-1090 Toll Free: 866/NYSERDA Fax: 518/862-1091 www.nyserda.ny.gov info@nyserda.org John B. Rhodes, pres./CEO NGVAmerica 400 N Capitol St., NW Washington, DC 20001 Phone: 202/824-7366 Fax: 202/824-7360 www.ngvc.org Matthew Godlewski, pres. North Carolina Dept. of Transportation 1501 Mail Service Ctr. Raleigh, NC 27699-1501 Phone: 919/825-2693 Toll Free: 877/368-4968 Fax: 919/733-9150 www.ncdot.gov Anthony Tata, sec. North Carolina Motorcoach Assoc. P.O. Box 31 Randleman, NC 27317 Phone: 336/495-4970 Fax: 336/495-5833 www.ncmotorcoach.org mellonee@burkechristiantours. com Mellonee Owenby, pres. 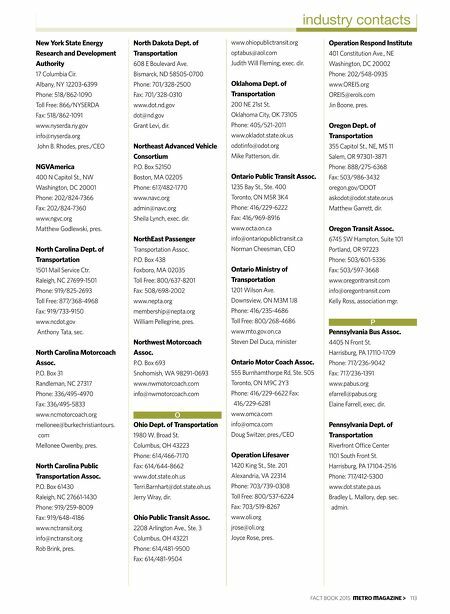 North Carolina Public Transportation Assoc. P.O. Box 61430 Raleigh, NC 27661-1430 Phone: 919/259-8009 Fax: 919/648-4186 www.nctransit.org info@nctransit.org Rob Brink, pres. North Dakota Dept. of Transportation 608 E Boulevard Ave. Bismarck, ND 58505-0700 Phone: 701/328-2500 Fax: 701/328-0310 www.dot.nd.gov dot@nd.gov Grant Levi, dir. Northeast Advanced Vehicle Consortium P.O. Box 52150 Boston, MA 02205 Phone: 617/482-1770 www.navc.org admin@navc.org Sheila Lynch, exec. dir. 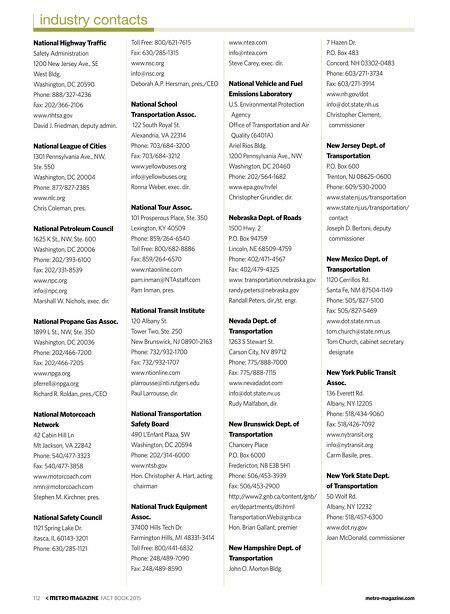 NorthEast Passenger Transportation Assoc. P.O. Box 438 Foxboro, MA 02035 Toll Free: 800/637-8201 Fax: 508/698-2002 www.nepta.org membership@nepta.org William Pellegrine, pres. Northwest Motorcoach Assoc. P.O. Box 693 Snohomish, WA 98291-0693 www.nwmotorcoach.com info@nwmotorcoach.com O Ohio Dept. of Transportation 1980 W. Broad St. Columbus, OH 43223 Phone: 614/466-7170 Fax: 614/644-8662 www.dot.state.oh.us Terri.Barnhart@dot.state.oh.us Jerry Wray, dir. Ohio Public Transit Assoc. 2208 Arlington Ave., Ste. 3 Columbus, OH 43221 Phone: 614/481-9500 Fax: 614/481-9504 www.ohiopublictransit.org optabus@aol.com Judith Will Fleming, exec. dir. Oklahoma Dept. of Transportation 200 NE 21st St. Oklahoma City, OK 73105 Phone: 405/521-2011 www.okladot.state.ok.us odotinfo@odot.org Mike Patterson, dir. Ontario Public Transit Assoc. 1235 Bay St., Ste. 400 Toronto, ON M5R 3K4 Phone: 416/229-6222 Fax: 416/969-8916 www.octa.on.ca info@ontariopublictransit.ca Norman Cheesman, CEO Ontario Ministry of Transportation 1201 Wilson Ave. Downsview, ON M3M 1J8 Phone: 416/235-4686 Toll Free: 800/268-4686 www.mto.gov.on.ca Steven Del Duca, minister Ontario Motor Coach Assoc. 555 Burnhamthorpe Rd, Ste. 505 Toronto, ON M9C 2Y3 Phone: 416/229-6622 Fax: 416/229-6281 www.omca.com info@omca.com Doug Switzer, pres./CEO Operation Lifesaver 1420 King St., Ste. 201 Alexandria, VA 22314 Phone: 703/739-0308 Toll Free: 800/537-6224 Fax: 703/519-8267 www.oli.org jrose@oli.org Joyce Rose, pres.